Annapolis Sailyard is the world's premier marketplace to find yachts for sale. Search motor yachts and sailing yachts for sale from various builders. New and used boats for cruising, sailing, sport fishing, high-performance, racing, and tenders are offered by respected brokers and private sellers worldwide. Search is simple and fast. "Lesser Light" is a very well kept 2008 Nordic Tugs 32+ with low hour Volvo D6 common rail diesel, electronics including rear facing camera display, custom upholstery and day/night shades, genset, heat and air, dinghy + OB, davits and more! BETTER than a new boat! Georgi Girl, A 2005 Nordic Tugs 42 Flybridge model equipped with bow thruster, dinghy and davit, heat and air, and more is now for sale in Maryland. Very clean boat, a must see! The Nordic Tugs 42 features a roomy layout and a large ship-style helm. The bridge also features a large chart table, 360 degree view and convenient access directly to the deck. Powered by Cummins Q Series, the Nordic Tugs 42's top speed is 18 knots, cruise 14 knots, or slow her down to 9 knots and burn under 3 gals / hour. Built to take the roughest passage with confidence, the hard chine semi-displacement hull gives this tug a stable quiet ride. The hull is hand laid fiberglass construction with full keel to protect the rudder and propeller. She features a spacious walk-around queen stateroom with private head, guest stateroom with head, U-shape galley, and large salon. The Catalina 320 was introduced in 1993,along with its little sister the Catalina 270,as the first in a series of designs intended to go head to head with the more contemporary,roomier,Euro-styled designs of Catalinas competitors.It was an instant success and remains in production with more than 1500 built. The most notable difference between the 320 and previous designs is the way in which the beam and transom,compared to the maximum beam,is considerably increased.This design resulted in a 10% bigger interior volume.This concept added considerably much more room for accommodations down below,while also increasing the cockpit size. 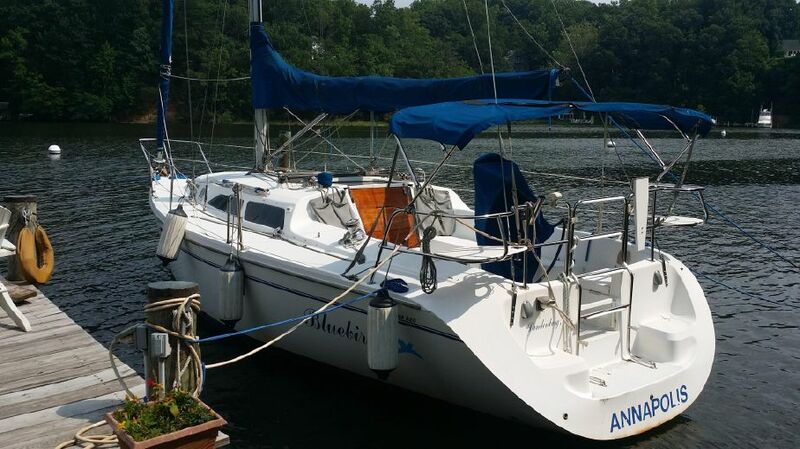 Located on the Annapolis Harbor in the Maritime Republic of Eastport!